Until recently, Chromebooks were budget laptops that sold for as little as $199. Although they were great values, their hardware didn’t compare with high-end laptops from Apple and others. Google changed that when they released the Chromebook Pixel. 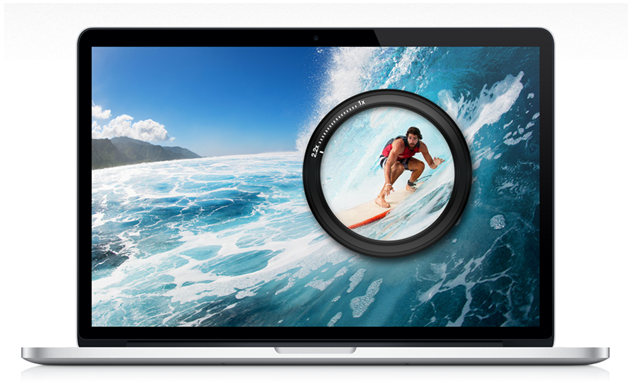 It’s specs aren’t just comparable to a MacBook Pro, they exceed it in several areas. But hardware isn’t everything, we’ll see how it stacks up in the software department as well. We’ll also compare it with Windows, iOS and Android devices. 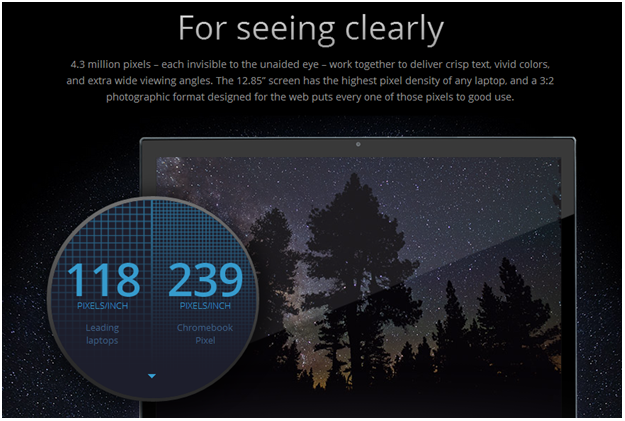 An exceptional display – The display on the Chromebook Pixel is superb. It has more pixels than a Retina 13″ MacBook Pro and its pixel-per-inch resolution exceeds every MacBook — including the new 2880-by-1800 Retina MacBook Pro 15″ (220 PPI). Whether you can actually see a difference is debatable because the numbers are close, but you’ll love what you see. It’s noticeably better than any PC laptop I’ve ever seen. Text on the Chromebook Pixel is razor sharp — not blurry and distorted like you get on PCs running Microsoft’s ClearType. No waiting – The days of waiting for your laptop to boot are almost over. This is an instant-on device. When you lift the screen the Pixel is usable in less than a second. That’s impressive, but where it really kills PC laptops is the time it takes to fully boot from a cold start. The Chromebook only takes 8 seconds to get to the sign-on screen and 8 to 10 additional seconds to fully load the browser home page. This may not sound fast, but it’s literally 10 times faster than the boot time of my new SSD-powered Lenovo laptop. One terabyte cloud-based storage – Although my Chromebook Pixel only came with 64GB of local storage. You can easily expand the storage to match a MacBook Pro by adding a 64GB SD card. These cards cost as little as $29. 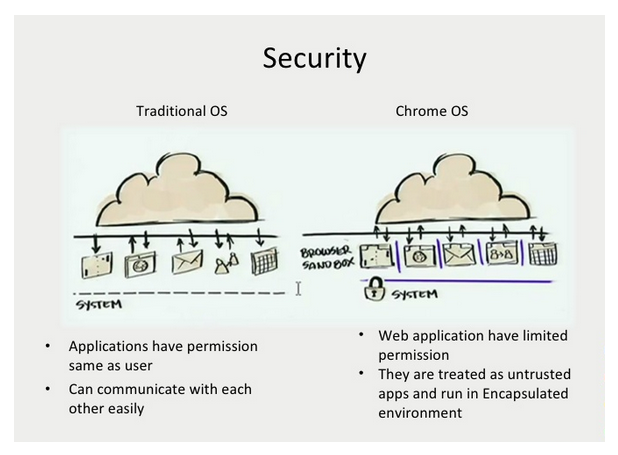 However, with the Chrome operating system, local storage isn’t that important. Where the Chromebook Pixel really shines is in the area of cloud-based storage. Google gives every Pixel user one terabyte of storage for three years. That’s 1029 GB or more than 200 times more storage than Apple users get. I’m trying to fill up my 1TB Google Drive, but it’s not easy. Almost immune to viruses and malware – When a Chromebook boots, it checks to make sure the operating system and firmware haven’t been tampered with. As a result, it’s not possible for keyloggers or other malware to run in the background. All data is encrypted, so no one can read your files. Each webpage you visit runs in a restricted environment, so visiting a site that’s been infected can’t affect anything else on your Chromebook. Apps you install run in Chrome’s sandbox as well, where they are isolated from the rest of the OS. Although browser extensions are allowed, you can’t install Java plug-ins or other software that opens up security holes. 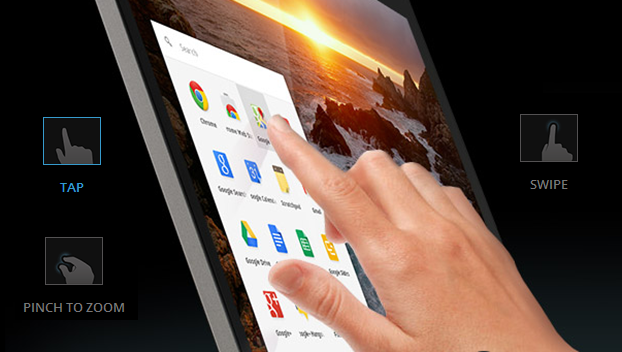 A responsive touchscreen and trackpad – The Chromebook Pixel comes with a touchscreen that is responsive and doesn’t affect picture quality. Although not all software supports touch, there are times like using Google Maps when it is extremely useful. However, most of the time you’ll be using the glass trackpad on the Pixel. It’s the best trackpad I’ve ever used and supports multi-touch gestures, such as two-fingered scrolling. 4G LTE support – Like a MacBook Pro, the Chromebook Pixel has dual-band 802.11a/b/g/n WiFi support. But Google goes much farther by including a 4G LTE modem, which is capable of download speeds up to 100Mbps. This is really useful when you’re not in-range of an open Wi-Fi network. For now I’m using the free 100 MB/month plan, but I’m considering upgrading to Verizon’s 1GB data plan, because it only costs $9.95 a month. It’s lighter and thinner than a MacBook Pro – Although no one is going to confuse a Chromebook Pixel with a MacBook Air. It’s thinner (16.2mm vs. 19mm) and lighter (3.35lbs vs. 3.57lbs) than a 13″ MacBook Pro. This is surprising because Apple is very good at making very thin and light products. A better auto-update system – The Chrome operating system (OS) handles software updates much better than any other OS I’ve used. Whenever a new security patch (or OS update) is available, the Chromebook Pixel automatically downloads and installs it in the background. No user-intervention is required. On major updates, the entire OS and browser are updated together, but they won’t be active until after you restart. Chrome keeps two copies of the OS around, so it can revert to an earlier version if something goes wrong. The best part is you won’t be constantly bothered with update requests like you are on Windows, iOS and Android. Better office apps – Google office apps have improved and are now better than most of the office apps you’ll find on iOS or Android. Some people even prefer Google Docs and Google Sheets to Microsoft Word and Excel, because of their value and real-time collaboration abilities. Great sounding stereo speakers – Even though the speakers on the Chromebook Pixel are hidden under the keyboard, they sound better than most other laptop speakers. I’ve got one small beef however, when you hold your fingers above the keyboard it acts as a filter and changes the sound slightly. Extra features – The Chromebook Pixel has a lot of nice extras like an integrated HD camera and noise cancelling mics, an anodized aluminum case, and a backlit keyboard that responds to ambient lighting and type of usage. I also can’t say enough about its keyboard, which feels wonderful and isn’t noisy as most laptop keyboards. Another nice extra is the twelve free GoGo Inflight Internet sessions Google gives you. Although the Chromebook Pixel’s hardware stands out in many areas, the Chrome operating system and app ecosystem seems a little rough around the edges when compared to Windows, iOS or Android. Here are some of the limitations in software and hardware which I’ve experienced so far. Over-dependence on the Internet – Although a few Chrome apps work offline, you need Internet access to take full advantage of this product. LTE support helps in places without Wi-Fi, but there are many places that don’t have access to any Internet. Apps like Google Music are useless when you are offline. Chrome could cache media files you’ve played recently but it doesn’t. 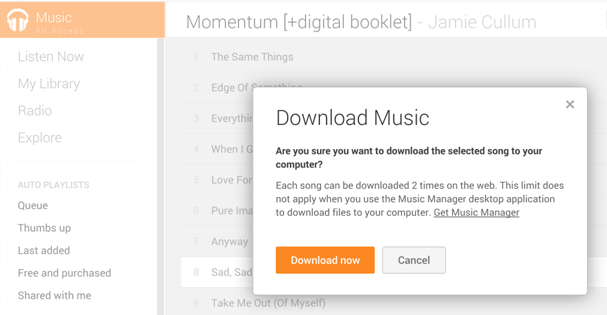 Although you can download songs for offline use, you can only do this twice (see the screen capture below) — even though Google’s PC-based Music Manager has no such restrictions. Google desperately needs to adopt a strategy like Dropbox, which keeps track of the changes locally, and syncs them after you get a data connection. Disappointing battery life – You can thank Intel for the relatively poor battery life of the Chromebook Pixel. You barely get 4 hours on LTE and although some claim 5-6 hours on Wi-Fi, I’m not seeing anything close to that. To add insult to injury, the i5 processor doesn’t feel as fast as the processors in the newest tablets. Heat is another serious issue. The metal case on i5-powered Chromebooks gets warm quickly, and the fan kicks after only a few minutes of video playback. Just how warm? I measured 120-128 degrees Fahrenheit on the bottom on the Pixel’s aluminum case. I’m confident all these issues would go away if this product had a Qualcomm Snapdragon mobile processor instead. Few great apps – Chrome’s dirty little secret is the fact that most of the so-called Chrome apps are not really apps at all, they’re shortcuts to existing web pages or browser plug-ins. This is my single biggest disappointment with Chrome OS. The few popular apps that are available in the Chrome Store are often missing important functionality found on other platforms. 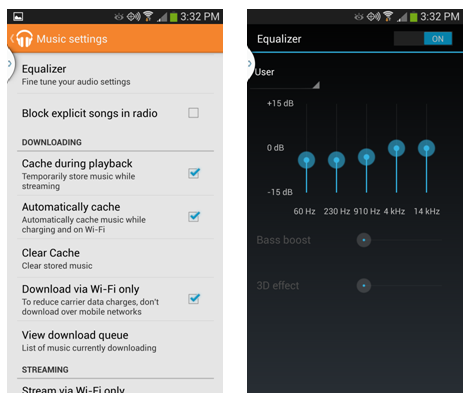 For example, Google Music on Chrome is missing EQ and advanced settings found on Android. Spotify for Chrome is missing many features found in their iOS mobile app. Google needs to encourage developers to create real apps, which don’t feel like they are running in a browser. There is some hope in this area. 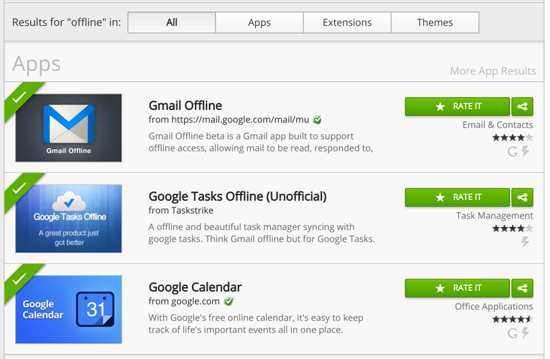 Last summer Google announced Chrome browser-based “Packaged apps” that look and behave like native apps. Packaged apps are closer to apps that are native, since they can run offline, display in a borderless browser that resembles an app window and can use APIs to gain access to a device’s hardware and other functionality. However, the creation of packaged apps isn’t happening nearly as fast as it needs to. Here are some of the best packaged apps that are available today. Microsoft Office compatibility issues – Although Google Drive is supposed to open documents created with Microsoft Office, it doesn’t always work. I tried to open a presentation created with PowerPoint 2010 and could not. Even after I manually imported the slides, there were issues with font sizes and the screen background didn’t look the same. Limited internal storage – Although it’s great that Google gives you one terabyte of cloud storage, the entry-level Chromebook Pixel only ships with 32GB of internal storage. This makes it hard to store a large collection of photos, music and movies locally so you can access them offline. Maybe this isn’t a problem yet, because I’m told you still can’t download movies to a Chromebook for offline viewing. Designed with touch as an afterthought – The touchscreen on the Pixel is nice, but touch seems like an afterthought on Chrome. Some apps don’t work well when you try to only use the touchscreen. Chrome doesn’t have a touch-friendly user interface like Windows 8, with its large tiles. Due to the high resolution screen, buttons on some web pages are hard to accurately click with your finger. Android has special logic to detect this, and zooms in so you can easily select the right thing. Not entirely intuitive – Chrome has some Windows-like user-interface concepts and some Android-style interface concepts, but is not near as intuitive as it should be. It also wasn’t obvious how to access app settings, update the OS, or do other basic things like right-click. Trackpad issues – One of the things I miss on this product is a right-click button. To get right-click commands to appear, you have to press with two fingers on the trackpad — which is louder than a dedicated button would be. You probably won’t notice this in a normal office environment, but it’s annoying in a quiet room. There is a good workaround however: You can touch the trackpad lightly and it still works. Limited I/O – I was surprised the Chromebook Pixel doesn’t have an HDMI out or a USB 3.0 port like Samsung’s Chromebooks have. It’s also crazy that you cannot plug-in a fast Ethernet cable when you are in environments with poor wireless connectivity. I purchased a USB-to-gigabit LAN adapter and DisplayPort-to-HDMI adapter to address these limitations. Can It Compete with a MacBook Pro? In terms of hardware the answer is yes. The Chromebook Pixel’s screen is better than the display on the Retina MacBook Pro. 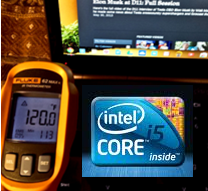 Both laptops use Intel i5 processors and the Pixel goes way beyond any Apple laptop with 4G LTE support, a terabyte of cloud storage, great sounding speakers and faster boot times. It’s also thinner and lighter than a 13″ MacBook Pro. Were this product falls short is mostly related to its operating system and applications, which can’t compete with Mac, Android or iOS devices today. Based on the issues listed above I wouldn’t recommended you pay $1299 to $1449 for a Chromebook Pixel. 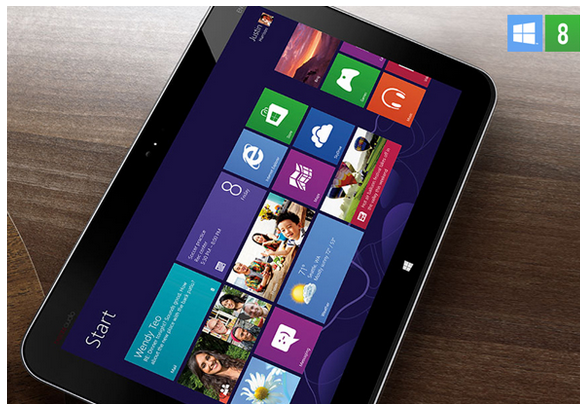 As good as the Retina-quality touchscreen is, it simply costs too much for what it does. For less money you could buy a Samsung Series 9 Ultrabook, MacBook Air or MacBook Pro and do much more on it. You’ll have a much better selection apps, fewer hardware-related issues and better battery life. Chrome OS is good for some things, but it’s not ready for prime time in some areas. 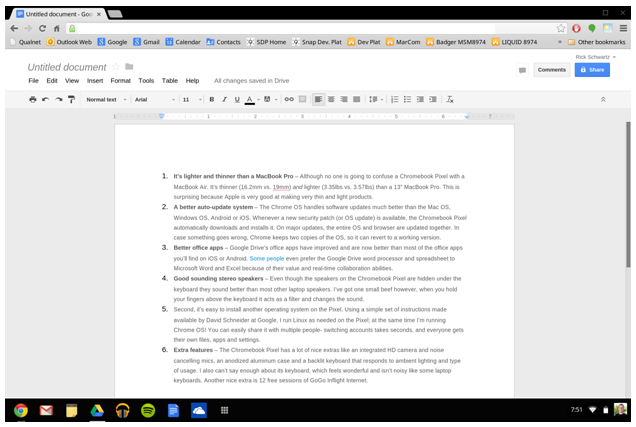 Although I’ve made it clear Chrome hardware and software needs work, I’m not giving up yet. I’m planning to keep my Pixel, because I’m enjoying learning the Chrome OS and I hope the software will improve in the future. By giving thousands of Chromebook Pixels to top developers, Google wants to encourage programmers to create new and improved Chrome apps. I hope a year from now we’ll see better Chrome apps available. I would also recommend a Chromebook to anyone who is looking for a computer for web browsing, email and writing. The next computers I buy my children and parents are likely to be Chromebooks. Google wanted to make a statement with this product that a Chromebook can be every bit as good as the best laptops. 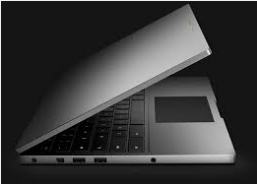 Influential tech writer Kevin C. Tofel of GigaOm affirmed this by saying “The hardware is on par with, if not better than, the MacBook Air I owned prior.” On this metric, I consider the Chromebook Pixel to be a success. 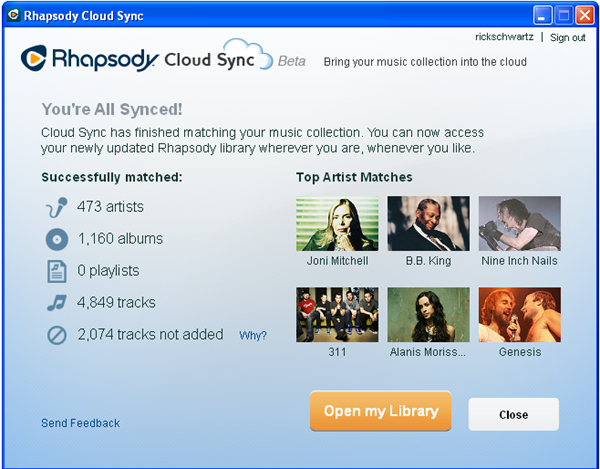 This is the first (and only) review of Rhapsody’s new cloud-based music sync service. When you see this on Engadget in a few months, remember that you saw it here first. Music lockers like Apple’s iTunes Match, Google Music and Amazon’s Cloud Drive. And of course we can’t forget the world’s first music locker: My.MP3.com, which launched all the way back in January of 2000. With so many music lockers out there, does the world really need another one? Rhapsody apparently thinks it does. 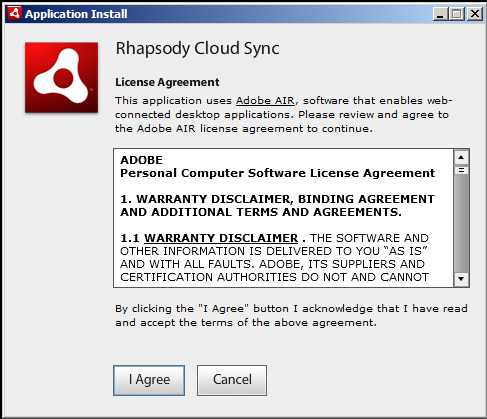 So let’s take a first look at Rhapsody Cloud Sync and see if we agree. There’s nothing too scary in the system requirements. 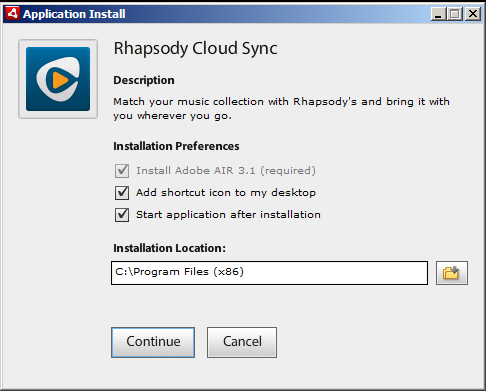 Rhapsody Cloud Sync should work with most computers and Netbooks sold over the past five years. Some people will be disapointed that no lossless file formats are supported (e.g. FLAC). And of course if you purchased music from iTunes before they removed DRM, you’re out of luck. 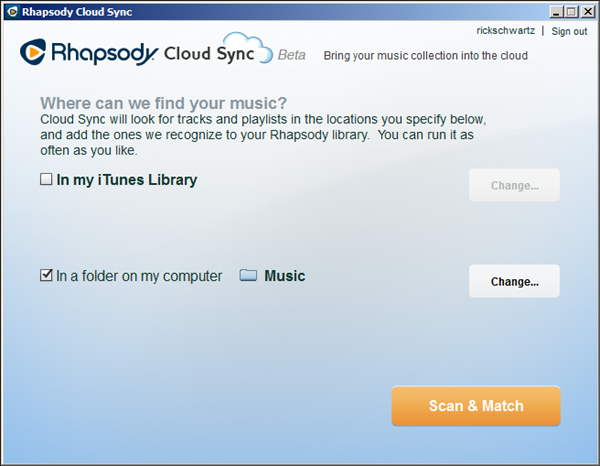 Rhapsody Cloud Sync is currently in Beta and only available to what Rhapsody calls Sounding Board Members. I was probably added to this list because I’ve participated in earlier Rhapsody polls. 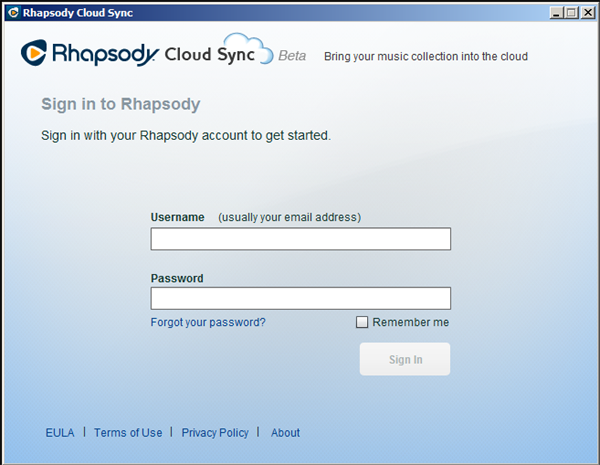 Although this Beta is closed to the general public you can download Rhapsody Cloud Sync for yourself if you follow me on Twitter @rickschwar. I recently tweeted the download link along with the username and password that you’ll need to get access to the software. You’re welcome. After you enter the credentials and log-in, you’ll see the first installer screen. For most, there’s nothing to change here, so press Continue and move on. I didn’t take the time to read the license agreement. I just blindly clicked “I Agree” like everyone else does. What we don’t know can’t hurt us right? Reminds me of the South Park “Human CentiPad” episode. The actual download and installation process was fairly fast. 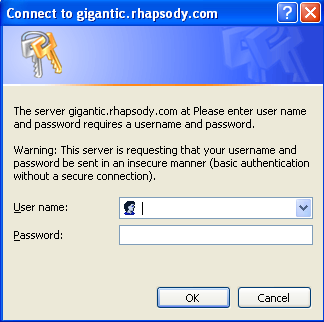 Hurdle #1: Now we’re asked to log-in to Rhapsody. 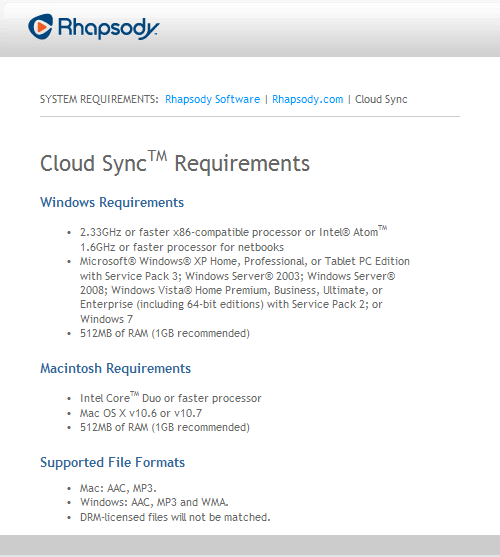 It would have been nice if they mentioned that a Rhapsody account is needed in the System Requirements. Although I have an account, here is where most people will stop. It’s worth mentioning that it took about 15 seconds to authenticate me after I logged in. Hopefully it doesn’t take that long every time you log-in. Of course the software needs to know where your music is in order to scan it. If you have your music in the My Music folder, or the default iTunes path, you can press the Scan and Match button now. During the syncing process, it was clear to me that something was slowing my computer down. 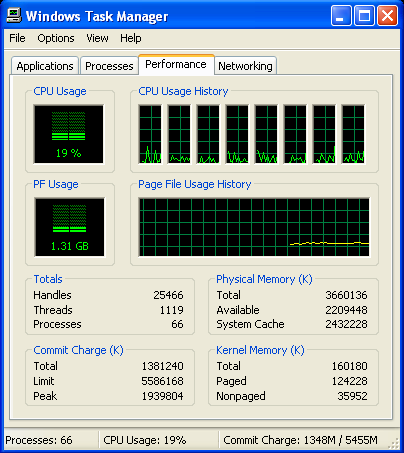 I checked the CPU usage and found it jumping between 4 and 20%. That surprised me considering the fact that I have an Intel i7 860 CPU which runs at 2.79GHz. My network bandwidth is 42Mbps upstream and 45Mbps downstream, so network bandwidth was not the cause of the slowdown either. After about 2 hours and ten minutes the cloud sync process finally finished. The bad news: Only 4849 of my 6923 tracks were identified. 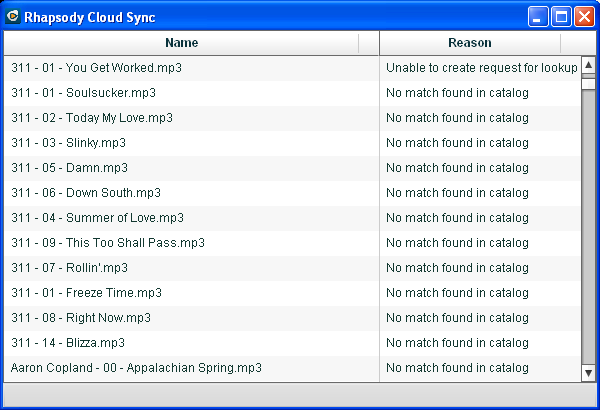 It’s possible that some tracks were identified, but Rhapsody doesn’t have permission to sync them, but I scanned the error log and 99% of the missed tracks said “No match found in catalog”. And it wasn’t just the more obscure songs that were missed, many popular artists had albums which could not be sync’d. Hurdle #3: I then clicked on the Open My Library button for the big payoff I had been waiting 2 hours for, but I had to sign-in again. This is probably a temporary restriction due to the Beta status of this software, so I won’t complain about it. 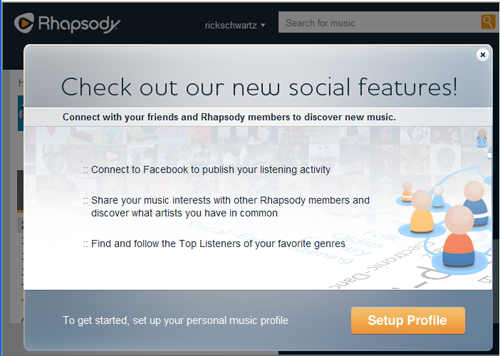 As you can see, Rhapsody is promoting the social features of their music service. Since I’m fed up with Spotify announcing what I do to my Facebook friends, I passed on the option to setup a music profile and connect to Facebook. Although the software is still beta, it’s not the cleanest user-interface I’ve ever seen. I clicked on profile and was a little surprised to see that Taylor Swift was my favorite artist. I never listen to her music. I was even more surprised to see that cabaret was one of my favorite styles of music. Again, I never listen to that type of music — not that there’s anything wrong with it. Then I remembered my daughter uses my Sonos controller 24/7 to music from Glee and Taylor Swift. Mystery solved! 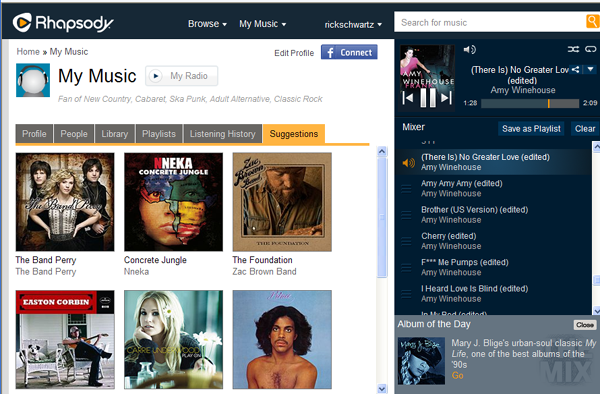 There are six tabs on the interface: Profile, People, Library, Playlists, Listening History and Suggestions. All of the tabs are pretty self-explanatory. You can see the Suggestions tab above. Profile contains info about me and my favorite artists. The People tab is blank because I didn’t link with Facebook. 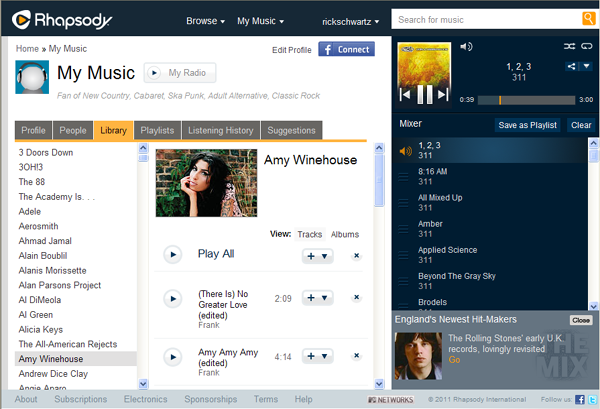 Playlists showed all of my Rhapsody playlists, which is nice. 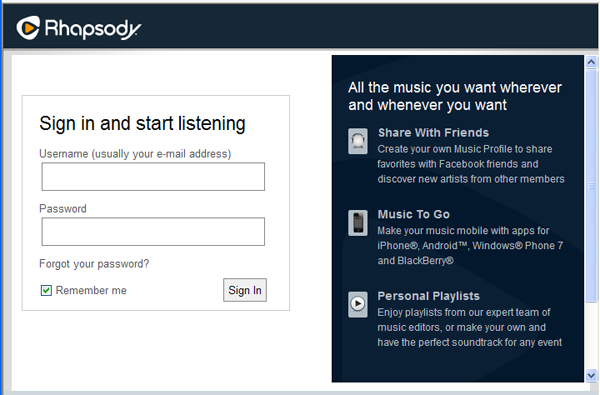 The Browse and My Music tabs at the top also take you to the Rhapsody subscription music pages. 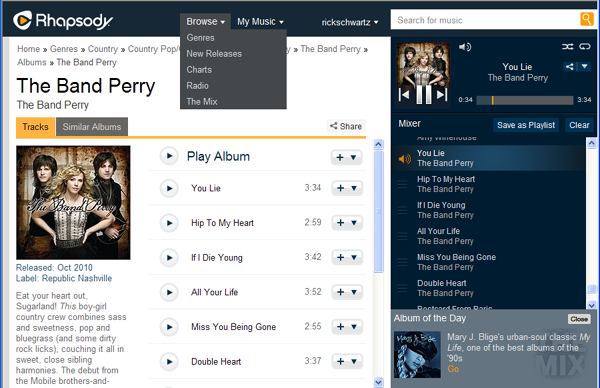 I like the player interface on the right, and how it works for my sync’d songs and music in the Rhapsody service. Playback was almost instant. Sound quality was good, but not great. Last I checked, Rhapsody was using the Windows Media codec streaming at 160kbps. I launched the Rhapsody app on my iPhone 3G to see what the experience was. Truth be told, I don’t use this app, because the last time I tried it is was painfully slow. It appears not much has changed. It took almost a minute simply to launch the app. The splash screen touted substantially improved music playback times. I can’t wait to find out if that’s true. I clicked on the My Library cloud icon at the bottom. Nothing appeared on the screen for the next 30 seconds. Then a screen worth of artists appeared, but it took another minute for the Updating icon to go away. I clicked on the artist “Adele” and it took more than a minute for album art and songs to appear on the screen. Granted, I currently have Wi-Fi off and I’m on AT&T’s horrible 3G network, this performance is unacceptable. Finally a picture of Adele appeared along with her bio, but still no songs. Another few minutes goes by… and finally two albums appear. This time it only took about 12 seconds to display the songs. I click on a song and 20 seconds later I hear music. If this is “substantially improved” playback, I can imagine what it was like before. 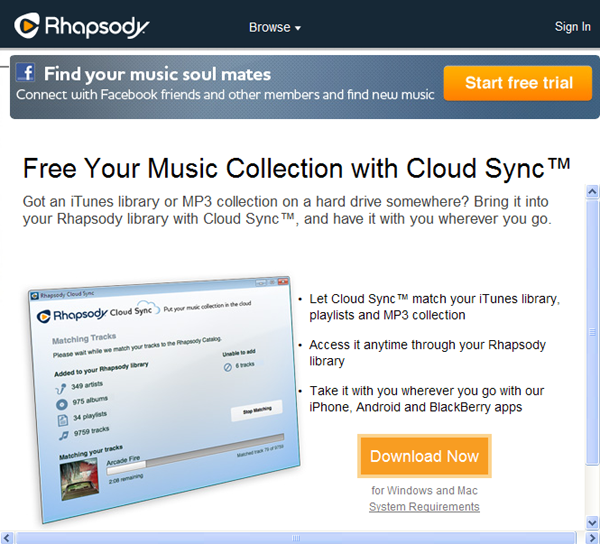 I just tried Rhapsody Cloud Sync with an Android phone running on Verizon’s 3G network. Playback speeds were much better on both 3G and Wi-Fi. It took about 2 seconds to begin playback over Wi-Fi, and 5-10 seconds to begin playback over 3G. I suspect their iOS app is capable of similar performance over Wi-Fi or a good 3G/4G network. Rhapsody has also release a new update for tablets, but I can’t run it because my Rhapsody account only lets me run on one mobile device. You have to pay more to run on 3 devices. 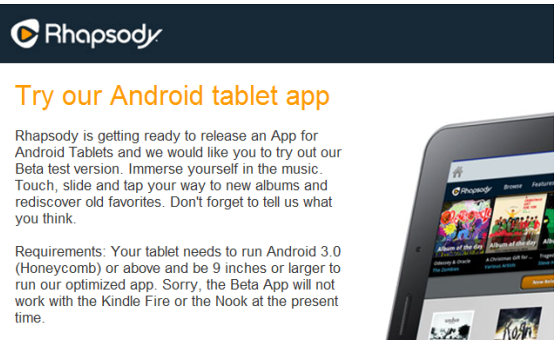 The Rhapsody Beta program has been expanded to include a new tablet version. 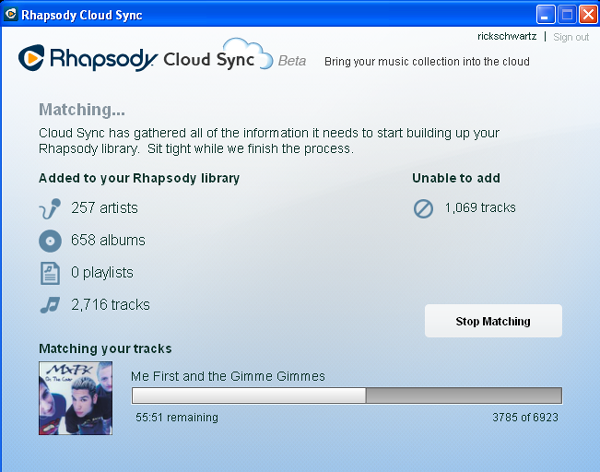 Rhapsody Cloud Sync appears to work pretty well on computers. Although it’s still Beta, I didn’t encounter any problems other than the ones I attribute to their slow iOS app. Although this service seems to work as advertised, I gotta be honest, while I’m a big fan of subscription music services like Spotify and Rhapsody, I don’t see that much value in uploading music to the cloud. The idea of anytime access to my music from computer, tablet or phone sounds good, but it only works when you have a good Internet connection. My experience using Rhapsody Cloud Sync over AT&T’s 3G network was very poor. Maybe I just don’t get it. Make a comment below to let me know what you think about this (and other) cloud-based music lockers.